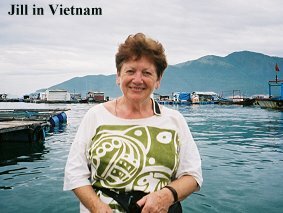 Hanoi: Last Sunday afternoon (17 June) I went out to the Women’s Museum which is south of the lake. Quite a hot walk, but nothing to standing inside the museum with its one or two badly placed fans! I dripped determinedly through photos of “young cadre pouring out her hatred through the barrel of a gun” and of extremely cheerful young female soldiers in the battles, etc. However there was some less propagandist stuff, like the piece of batik cloth which a woman wore to disguise herself as a Cambodian peasant when actually she was delivering messages to the Viet Cong, or the bra which someone used to stuff clandestine info down, or the large mortar and pestle which a woman used as a signal to the troops/villagers. And some letters from the “front”, desperately like our troops’ letters home from the trenches in WWI – one young woman added a PS to her young brother and sister to do their homework and look after their mother. She was killed five days later. So “Charlie” was also “Charlene” – but I don’t think we heard too much about her back in the ’60s. Upstairs, in a less humid room was a far less interesting exhibition – rows of posters of exemplary mothers who’d slaved away at at least 3 jobs so that their children could study to become teachers, doctors, engineers, etc. etc. As it was hot I sought shelter in the lakeside cafe, a smart move as a huge rainstorm blew in. Later I discovered I got sunburnt on the back of my legs below my shorts! I’m being careful about sunburn cream now. Anyway, as mentioned, I got away to the Sapa train safely. A bit of an adventure, but not too much so. I was in a 4-berth cabin, with 2 Vietnamese women and one young Vietnamese man. We put out our light soon after the train drew out – at 9.15 sharp! – and I slept reasonably well. However, arriving at 5.30, I needed it! I got a bit of a shock at just how touristy Sapa is – a sort of mountain resort with the minority groups on the sell, sell, sell. Having an “English pub” put me off a bit too. However things got better, especially as the ethnic people don’t just tout their handicrafts but are involved in guiding etc. etc. Later: Here’s a burst about the Sapa Experience, and I’ll write it with L** in mind – because she’d be interested, but also because there are comparisons with our Thailand hill-tribes trek. First, Sapa is up high, in the clouds a lot of the time, but you climb up quite suddenly from the train station, Lao Cai, which is on the Red River almost on the border with China. Sapa’s a small township, lurching on the mountainside in such a way that you look directly at the mountain range in front of you, and upwards to the mountain tops or to the clouds covering them. And then you look down into the valley terraced with paddy fields and planted with trees and rows of vegetables. Really beautiful. It did remind me of the place L** and I were in on my birthday 9 years ago – Mae Salong I think was the name, although that had vast distant vistas. But the township is very different from Mae Salong. It’s more like Thredbo [Australian ski resort]. Lots of chalet-type buildings winding up the hillside, with lots of tourists and lots of hill tribe people flogging stuff off pretty aggressively. There’s the English pub, and a pizza restaurant where I actually saw people drinking wine. However it does get better. On my first night I went up to “Sapa heights” where the “town square” is, and had a meal in a Vietnamese-type cafe where I could sit out and watch the passers by. Just as I was thinking there are no women here, bent under bundles borne on poles on their shoulders, one appeared but bent almost double with a huge basket on her back as well. Oh dear. The young woman who served me, in between fascinated absorbtion with a Western on TV, suggested I go for a walk around Sapa Lake, so I did. I joined some strollers and some power-walkers when one little hill-tribe girl, in the H’mong tribal get-up, called out hello and asked me where I was from. “Australia”, I said brightly. “Sydney? Melbourne?” she shot back. Making it pretty clear that her day job was working the tourists. Next day I booked on a one-person car tour to Cocly, where the Flower Hmong people have their Tuesday market. My guide was Tom, a nice looking young man who, it turned out, was a Tay (similar to Thai) ethnic person, from a nearby village, Ban Ho. (Liv may remember that the villages we stayed in in Thailand were all ‘Ban Something or Other’). He was 25, educated in his village and in Lao Cai – therefore tertiary – and his English was excellent and his manner pleasant. So that was surprise no. two. I can’t possibly imagine those people whose houses Liv and I stayed in, or those tribespeople selling stuff in their roadside stalls in Mae Salong, being so integrated into the economy as Tom was. I say ‘the economy’ rather than ‘Vietnamese society’ because the Sapa area has about 42.000 people of whom only 6,000 are Vietnamese as distinct from being members of one or other ethnic group. The Cocly market was a real market – trading bullocks and horses, selling chooks and pigs, forging metalware and selling food and a foul-smelling, well overproof alcoholic potion from plastic kerosene bottles which amazingly didn’t melt under the strength of the liquor. There was also the handicraft and there were tourists, but not overwhelmingly. So it was a good choice, and I got to see a lot of the countryside as well, in the course of getting there. (Cocly is east of Lao Cai, so it was a few hours drive to get there). 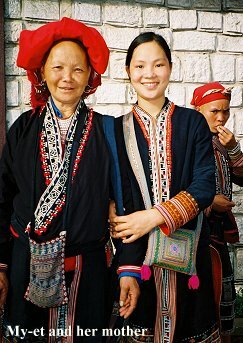 In the evening, back in Sapa, I was walking past a couple of girls wearing a rather attractive style of embroidered pants I’d eyed off on others of the same tribe. We got talking and one of the girls, My-et, said that she could indeed sell me a pair, but she’d have to get a sample from her sister who lives in Sapa. She, My-et, lives in her village, Tarfin, usually, but at the moment it’s school holidays so she’s working the Sapa markets. She’s Red Zao, aged 16, just finished Year 9 and does not learn English at school – just from what she picks up from the tourists! Anway we made an arrangement that she’d call at my hotel after 8 pm with the pants. She did, I bought them and she agreed to meet me again the next day so I could photograph her. When I did meet her the next day her mother was in town, doing the markets, so I’ve got a photo of both of them. And that photo will be worth a million words, so I’ll say no more! On my last day, the Wednesday, I arranged to do a walking tour to some nearby villages. By this time I was not surprised that I and the other assembled guests were met by a young woman in Red Zao clothes. Ta-mae was her name and she is a full-time guide – like Tom and similarly interesting and helpful. We all walked down – and down – to Cat Cat, just below Sapa. There are stone steps a lot of the way, but they were OK. There were 4 young Singaporeans in the group as well as two Malaysians (Shyan and her husband, Derrick) and me. On the way down one of the Singaporeans asked me if I exercised regularly. Of course I was able to say yes, but I was really wondering how decrepit I looked! The houses we passed, and in one case entered, were made of wood, plank-style, with thatched roofing – small and smoky with a storage loft above the room at each end of the house. The one we entered had no traditional altar of any kind and Ta-Mai told me that this family is Catholic, “so does not worsip (sic)”!! Outside this and every house are the vats in which they make the blue dye used in their fabrics. The houses were more or less grouped together, going down the hill, and surrounded by the paddy fields being worked at the time. Water is not a problem. They wouldn’t need the village tank which L** and I saw in a couple of the villages we stayed in. In fact, Cat Cat means waterfall, and at the bottom of our step walk we came to one, a very powerful one which the French had harnessed for hydro-electric power. A pretty old power station by now, which might explain the occasional power failure experienced in the hotel in Sapa. Anyway we were due to walk back up to Sapa – by road, not by the steps – but the young Singaporeans took motor scooters. Derrick, Shyan and I walked, to Derrick’s great triumph as, at the ripe old age of 41, he’d feared earlier that he’d have to be carried back! So that pretty much covers Sapa. This may be the last lengthy email, if only because I’ll be in company from tomorrow. However these emails have been my diary – you’ll keep them without my even asking, I know! – and have proved very convenient for me, as well as giving me your company, in a way.